Steak lovers concerned themselves with a number of different factors, chief among them the cut of beef. The loin part of a cow provides both rib eyes and tenderloins, which are among the priciest beef cuts. Rib eye steaks, preferred by those looking for marbling and rich, beefy flavor, come from the top loin and sirloin portion and are less tender than tenderloin cuts. Tenderloin steaks or filet mignons are cut from the tenderloin section and are valued for their fork tenderness and lean, unmarbled flesh, although some consumers find them lacking in taste and character. Rib eye steaks are cut from the rib eye roast, which is located in the large center muscle of a cow’s ribs. Prime rib, a favorite among beef aficionados who prefer flavor to tenderness, comes from the beef rib eye roast and has to have the grade of “Prime” to be sold as prime rib. Prime beef is often only available for commercial sale. Beef rib eye roasts are sold as large or small end types. The large end beef rib roast includes the sixth to ninth rib bones near the large end of the section and is traditionally slow roasted with the layer of fat left on top to keep it moist during cooking. The smaller end is usually cut into bone-in rib steaks and prepared by grilling, broiling or pan-frying. The beef tenderloin is the tenderest part of the whole cow. It is an elongated piece of meat with one large end that tapers to a thin tail at the opposite end. It can be roasted whole as a Chateaubriand, or spread with liver pate and baked in a puff pastry crust using a Beef Wellington recipe. When sliced into steaks, the cuts from the larger end of the roast are referred to as filet mignon. As the steaks become smaller, they are marketed as tournedos. Because it is so tender and lean, beef tenderloin meat is not usually marinated and seldom cooked more than medium rare. Filet mignons are usually grilled, broiled or pan roasted. To get the best and freshest cuts of meat, find a local butcher for your purchases of beef steaks rather than buying them prepackaged at supermarkets. A butcher can also suggest preparation methods and cut your fresh steaks to the desired thickness. For best results, season steak with salt after cooking to prevent drying out the surface. 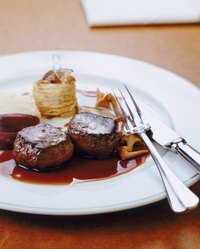 How to Tell If Beef Tenderloin Is Spoiled?